Mr. Scrumptious and I honeymooned in the amazing Borneo and Malaysia more than three years ago and recently I was craving the fiery and flavorful noodle soup so common there. Curry Laksa is a traditional chicken curry noodle soup and I wanted to throw together my own simplified version of it. While it doesn't look incredible in these photos, the flavors are so intense and memorable that I wanted to share it with all of you. For a cold winter's night, it will heat up your mouth and remind your tastebuds that an adventurous palate makes life endlessly interesting. The dish is hot and hearty, creamy and slightly sweet from coconut milk. Yes, there are a lot of ingredients, but if you get them all measured and prepared efficiently then the actual cooking only takes a few minutes. There are several things I omitted from the traditional recipe due to the fact that I was cooking from my pantry and hadn't shopped beforehand. Laska is quite regional and varies depending on exactly where you are, but usually it includes a paste made of brine shrimp, several varieties of chiles and kasturi limes. I omitted the shrimp paste completely and worked from available red chiles and regular limes. Also, it's usually made with bone-in chicken thighs but I used chicken breasts here. If you use the bone-in thighs, leave the skin on and cook about 40 minutes on step 3. It gives a much richer, more hearty and deeper flavor if you use the chicken thighs. 1. Put the coriander, cumin, fennel, cloves, peppercorns, turmeric and chiles in a small food processor. Pulse until the spices are a fine powder, making sure there are no large pieces of whole spices. Next, add the shallots and 1/2 c. water to the spice powder. Pulse until you have a chunky but smooth paste. Set aside. 2. Heat the oil in a 4-quart saucepan or soup pot over medium-low heat. When the oil is hot, add the cinammon stick and stir about 30 seconds, until you smell its aroma. Add the ground paste and saute and then reduce heat slightly to prevent scorching. Stir frequently, cooking until the shallots become transluscent and seem to melt a little. Add the lemongrass and chicken and stir well to combine with the flavoring paste and saute, stirring often, until the chicken is golden. About 5 minutes. 3. Add the water, coconut milk, sugar and salt and stir well. Cook gently another few minutes, until the chicken is cooked through. 4. Meanwhile, fill a saucepan with water and bring to a boil. Add the bean sprouts and blanch until they just start to soften, no more than 20 seconds. Remove with a spider or slotted spoon and let the sprouts cool in a colander. Bring the water back up to a boil and add the noodles, cooking about 3-5 minutes and drain. 5. To serve, divide the bean sprouts between the four bowls and place in the bottom of the bowl. Follow with the noodles, in a mound over the sprouts. Ladle the chicken curry over the noodles. Garnish with additional chile if desired, lime and mint sprigs. Squeeze the lime over the noodles and eat promptly. I needed a culinary vacation and this may be just the ticket! And I'll try it with the thighs--I much prefer dark meat to white. Lisa, this should do it. The thighs are much better, indeed. I just didn't have them on hand when I made this. Yvo, glad you like the photo too! Yes, it could fly without the coconut milk, but you're right -- it just would miss the sweet softness. I'd use only 1 or 2 chiles if you're skipping the coconut milk. You could also try a tablespoon of plain yogurt in the base of the spice/shallot mixture. That might help mellow it up. Let me know what you think! 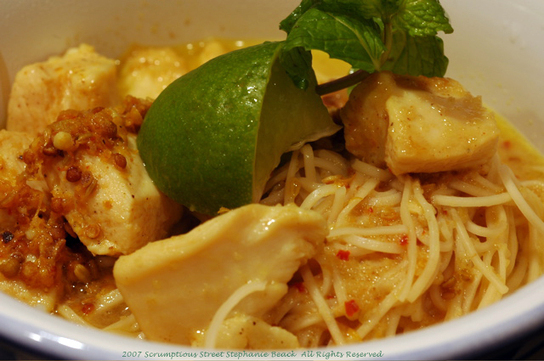 Seeing this Laksa recipe stirred up all kinds of memories of my 9 months in Australia. I sympathize with your craving for the flavor. It's just an entirely different kind of spiciness compared to the jalapeño spiciness that I'm typically used to. When I was in Sydney, I would eat Laksa at least once/week for lunch. You'd (at least I was) be very surprised at how strong the Asian influence is on their diets in Australia. I used to go to a Malaysian soup cafe that served several types of Laksa. I typically got either the chicken or the prawn laksa and I was always more partial to the prawn. The chicken laksa had all kinds of chicken parts in it - it was definitely not all breast meat. It was delicious all the same! The recipe looks great. To be honest, I never really knew what was in it. Michael, thanks for sharing your fond memories! I can just imagine how wonderful your time in Australia was, I have been there once and simply loved it. Australia is just along the spice route, so it definitely received the benefits of curries and spices from Southeast Asia and India. Fascinating how once those flavors arrive, they become incorporate into a land's culture permanently, isn't it? Yes, tradition is always chicken with bone-in and I like your "chicken parts" reference even better. Glad to hear you weren't afraid. The prawn variation sounds wonderful. I'll have to try that next time. I'm so happy you shared your memories with us. Thanks! I remember eating laksa on my very first day in Malaysia. The taste was so intense -- it was all part of the sensory overload I was experiencing upon arrival in that country. It was the first of many bowls of laksa we tasted as we traveled from night market to night market. I fell in love with it at first bite. Kristen, thank you and welcome to Scrumptious Street! I haven't heard from you before. It's nice to have you here. Lydia isn't it just wonderful? Those first impressions are one of my favorite things about traveling and indeed, one never forgets. The nights markets are spectacular, what a vibrant place to engage in a new culture, right?